I do not want to need reassurance that what I do matters; that who I am is enough; that the way I see is acceptable. Even as I write this, I realize that it makes no sense to look to another to confirm what is uniquely my experience. Recently I came across an interesting personal photography project, Letters on Top of Buildings, by Cynthia Connolly. 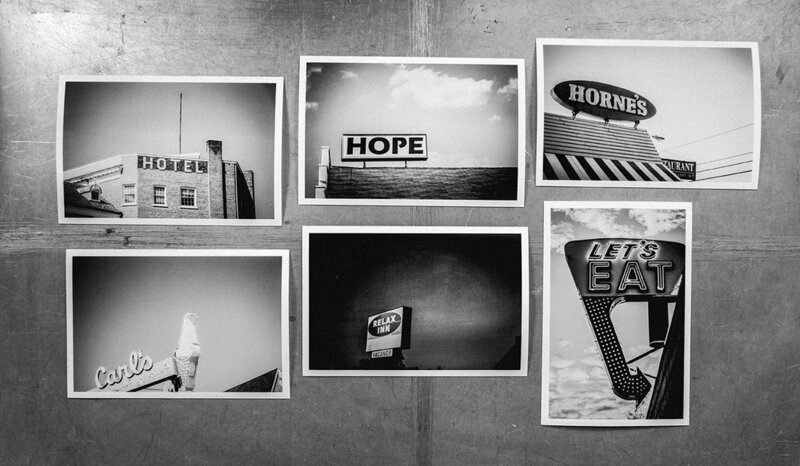 Her photographs–signs and letters, perched atop buildings, black and white silver gelatin prints, presented in a letter pressed envelope—remind me of the familiar landmarks in and around my home. These iconic signs, with their distinctive typography, mark the boundaries of the places we live and work. They welcome us, guide us, and often set structure to our dearest memories. I thought to myself, “What a clever and creative idea!” And then, as I studied Cynthia’s pictures, I realized that I have taken similar photographs. I had categorized them as snapshots, mundane and not worthy of further attention. I wonder why I was so quick to dismiss my work. Did I only see the value of my similar photos when I looked at them through Cynthia’s eyes? Bringing my photographs of letters on top of buildings together strengthens their impact. Converting them to black and white and printing them as sliver gelatin prints honors the timeless nature of such content—typographic sculptures—and signs of the times. If you visit Fredericksburg, look me up, and I’ll take you to Carl’s Frozen Custard for two scoops of one of the three available flavors: chocolate, vanilla, or strawberry.